Yesterday I mentioned that because I couldn't find a USB stick, I had rigged up a clumsy ad hoc network just to transfer one file. It turns out that the USB stick wasn't actually lost. It was.... only resting, deep in a pocket of some pants that had gone into the wash. The pants have now come out of the wash -- in specific, a trip through the washing machine and the dryer, though not the ironing board. Of course only after all that was the USB stick discovered. With a sense of doom, I tried it -- and it still works fine! All the files that were on there before are on there now, and perfectly readable. I just used it to make another file transfer: no problem. It even passes the performance tests for "ReadyBoost" service as temporary RAM under Vista. 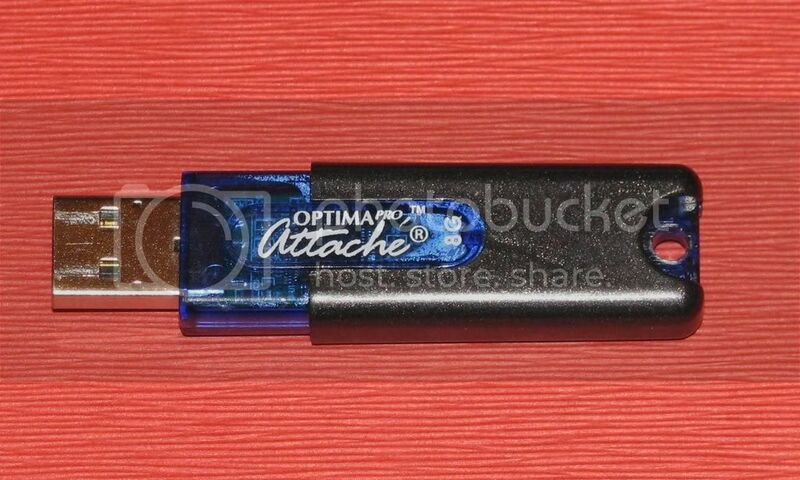 So if you're looking for the USB stick that, in the words of the ancient Timex slogan, takes a licking and keeps on ticking, I say: look no further than the PNY Optima Attache 8GB model. This genuinely surprises me. And think of the seconds you'll save not having to empty your pockets. PS the reddish background in the picture above is not some lush grosgrain but the back cover of Bowl of Cherries, a racy recent comic novel about teenaged lusts, the war in Iraq, modern college life, etc. It is the first novel from Millard Kaufman, who was born in 1917. He is said to be at work on his second. Endurance champ of a different sort.